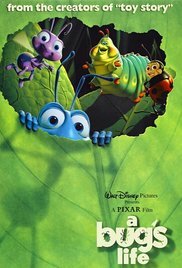 Storyline:  A Bugs Life 1998,Flik (Dave Foley) is an inventive ant who's always messing things up for his colony. His latest mishap was destroying the food stores that were supposed to be used to pay off grasshopper Hopper (Kevin Spacey). Now the strong-arming insect is demanding that the ants gather double the food -- or face annihilation. To avert disaster, Flik goes on a journey to recruit fighters to defend the colony. When he meets a band of high-flying circus insects, he thinks he's found his salvation.